Muriel Bowser (born August 2, 1972) is the mayor-elect of Washington, DC, and a member of the Council of the District of Columbia representing Ward 4. In the 2014 mayoral election, Bowser was elected as Mayor of Washington, D.C. She is a member of the Democratic Party. She will be the second woman to be elected mayor after Sharon Pratt Kelly. The youngest of six children of Joan and Joe Bowser, Muriel E. Bowser grew up in North Michigan Park in northeast DC. In 1990, Bowser graduated from Elizabeth Seton High School, a private all-girls Catholic high school located in Bladensburg, Maryland. She received a college scholarship due to her excellent grades. Bowser graduated from Chatham College in Pittsburgh, Pennsylvania, with a bachelor's degree in history, and she graduated from American University with a Masters in Public Policy. She moved to Riggs Park in Ward 4 in 2000. Bowser began her political career in 2004, running unopposed for Advisory Neighborhood Commission (ANC) representing Single Member District 4B09, which includes the neighborhood of Riggs Park. She was unopposed again in 2006 when she ran for reelection for the position. Adrian Fenty, member of the Council of the District of Columbia representing Ward 4, ran for mayor of the District. Bowser was his campaign coordinator for Ward 4. When Fenty was elected mayor, a special election was called to fill his council seat. Bowser, among many others, announced her candidacy for it. 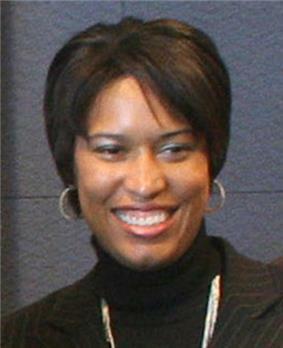 In 2008, Bowser announced her reelection campaign for the Council. Three individuals ran against her in the Democratic primary, namely: Baruti Akil Jahi, former president of the Shepherd Park Citizens Association; Malik Mendenhall-Johnson, then serving as Advisory Neighborhood Commissioner of 4B04; and Paul E. Montague, who was Advisory Neighborhood Commissioner of 4B07 before being recalled in 2004. Both Jahi and Mendenhall-Johnson criticized Bowser, saying she was a rubber stamp for Mayor Fenty and that she was unconcerned with her constituent's needs. On March 23, 2013, Bowser announced that she would run for mayor of the District of Columbia. Her campaign's chair is former council member William Lightfoot. Bowser emphasized that she can connect with longtime residents concerned about the rapid changes occurring in the District, while still celebrating the changes that had occurred. Bowser disdained business as usual and corruption in the District's government. She favored free Metro fares for students. She was against increasing for the minimum wage only for employees of large retailers. voted against Bowser was criticized for being too inexperienced for the position, with too few legislative accomplishments while on the Council, and for having a platform that was short on details. Bowser was endorsed by EMILY's List and the editorial board of The Washington Post. She won the D.C. mayoral primary election. In the general election, Bowser was on the ballot with Independent Nestor Djonkam, Independent David Catania, D.C. Statehood Green Faith Dane, Independent Carol Schwartz, and Libertarian Bruce Majors. Bowser won the election and will take office on January 2, 2015. ^ "Annual Report, 2006-2007". Elizabeth Seton High School. Archived from the original on September 10, 2008. ^ Local elections 2008: Muriel Bowser. The Washington Post. Retrieved 2008-06-27. ^ a b Woodlee, Yolanda; Silverman, Elissa. Hopefuls Begin Staking Out Fenty's and Gray's Seats. The Washington Post. 2006-09-20. ^ Ward 4 with ANC & SMD Boundary. District of Columbia Board of Elections and Ethics. Retrieved 2008-06-30. ^ a b "Certified Official Results Report" (pdf). District of Columbia Board of Elections and Ethics. November 21, 2006. Archived from the original on November 30, 2006. ^ a b Silverman, Elissa. Fenty a Strong Presence in Crowded Ward 4 Race to Replace Him. The Washington Post. 2007-01-23. ^ Silverman, Elissa; Woodlee, Yolanda. Fenty's School Takeover Plan Gets Rough Reception. The Washington Post. 2007-03-02. ^ Woodlee, Yolanda. Candidates Focus On Fundraising In Wards 4, 7. The Washington Post. 2007-03-06. ^ a b Woodlee, Yolanda. Top Fundraisers Feel The Heat in Ward 4. The Washington Post. 2007-04-27. ^ Woodlee, Yolanda; Silverman, Elissa. Who Will Fenty Support in Ward 7? The Washington Post. March 8, 2007. ^ The D.C. Special Election: Muriel Bowser in Ward 4 and Victor Vandell in Ward 7 are the best bets for council. The Washington Post. 2007-04-15. ^ Muriel Bowser Receives the Metropolitan Council, AFL-CIO Endorsement (pdf). Muriel Bowser for Ward 4 2008. Press release. 2007-04-10. ^ Silverman, Elissa; Labb, Theola. Dueling Endorsements for Vacant Seats. The Washington Post. 2007-03-22. ^ Muriel Bowser Endorsed By The Fraternal Order of Police, Metropolitan Police Department Labor Committee (pdf). Fraternal Order of Police, Metropolitan Police Department Labor Committee. Press release. 2007-03-15. ^ a b List of Candidates for the September 9, 2008 Congressional and Council Primary Election (pdf). District of Columbia Board of Elections and Ethics. 2008-07-03. ^ Stewart, Nikita. Local Election Season Quietly Kicks Off. The Washington Post. 2008-05-11. ^ Advisory Neighborhood Commission 4B. Government of the District of Columbia. Retrieved 2008-07-15. ^ Stewart, Nikita R. And They're Off! The Washington Post. 2008-05-11. ^ DeBonis, Mike. Incumbents Rake In Stein Club Endorsements. Washington City Paper. 2008-06-19. ^ Freed, Benjamin (February 25, 2013). "Political Groups Line Up to Endorse DC’s Mayoral Candidates, Real and Hypothetical". Washingtonian Magazine. ^ "Sample Ballot, General Election, November 4, 2014". District of Columbia Board of Elections. 2014. Retrieved October 15, 2014. ^ "Council Primary Official Results". District of Columbia Board of Elections and Ethics. April 19, 2012. ^ Certified Results. District of Columbia Board of Elections and Ethics. November 6, 2012. ^ a b "Mayoral Primary Official Results". District of Columbia Board of Elections. April 1, 2014. Boston, Atlanta, Massachusetts, Indianapolis, Washington, D.C.